Seven broadsides, letters and other items concerning the illegal immigrant ship SS Patria. Palestine, November 1940. Hebrew and English. 1. Petition from immigrants on SS Patria to the High Commissioner, pleading to be allowed to stay in Palestine: "There are among us hardly any enemies of Great Britain and Palestine… there are among us 500 Chalutsim who prepared themselves for years intensively for life in Eretz Jisrael… hundreds of our young men […] are eagerly ready to join a Jewish-Palestine troup…". Signed (in print) by representatives of the illegal immigrants: Ephraim Frank, Abraham Kornfeld and Jochanan Rabel. Typewritten (English). 2-3. A letter sent to the British High Commissioner by Esther Mittelman from Tel-Aviv, requesting to let her cousin Meyer Halberstam and his wife Miryam Halberstam to disembark SS Partia and enter Palestine. The sender declares that she will do her utmost to support her relatives in the country. Typewritten (English). Enclosed with the letter is a reference letter written by David Zvi Pinkas, then CEO of Mizrachi Bank in Tel Aviv and a future Scroll of Independence signatory, testifying to the character and professionalism of Meir Halberstam, who had worked in the bank owned by Pinkas family in Vienna. (English). 4. Broadside from November 24 or 25, 1940, informing Jewish inhabitants in Palestine that illegal immigrants waiting to be deported on SS Patria announced a hunger strike, that on the same day another ship arrived [Atlantic] and that the passengers on board of this ship will be deported to "remote British colonies". The broadside calls to demand that the immigrants be allowed to stay in Palestine. 5. 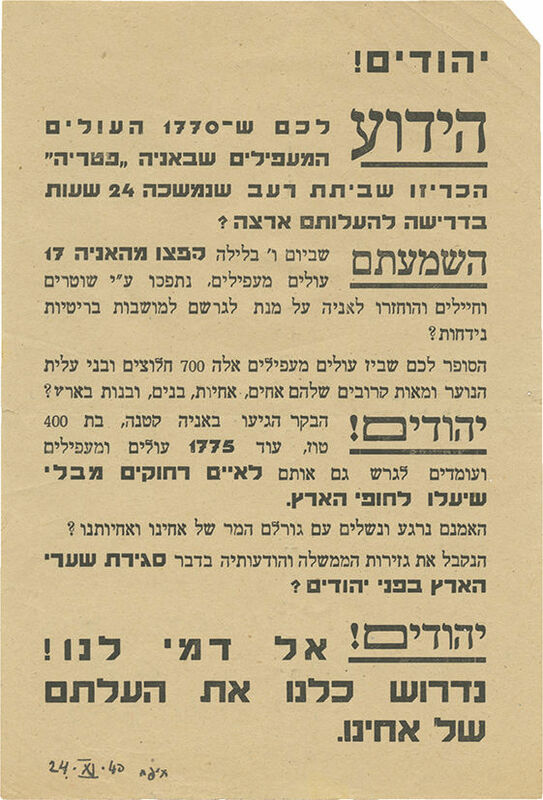 "Yizkor", broadside in memory of the Patria victims, dated 28.11.1940, demanding to let the survivors stay in the country. Signed "Mishmar HaYishuv". 6. Printed paper strip for collection of donations for Patria immigrants. 7. Letter from the "Committee for Patria illegal immigrants" confirming receipt of a donation on the amount of 1 pound by Z. Aharonovitz (later Zalman Aran, Minister of Education in Mapai governments), dated 31.12.1940.